It's a popular investment theme, but some possibilities are not that obvious. Investing in robotics is a popular idea, but sometimes you have to dig a bit deeper to find stocks exposed to the theme. In this context, I think Cognex Corporation's (NASDAQ:CGNX) machine vision solutions, Rockwell Automation Inc.'s (NYSE:ROK) industrial automation technology, and NICE Ltd.'s (NASDAQ:NICE) data analytics and artificial intelligence (AI) are well suited to profit from increased spending on robotics. Let's look at the case for each of the three. If companies are going to increase spending on automation and robotics, then they will need to monitor and control these manufacturing processes. This is where Cognex's machine-vision solutions come into play. Moreover, Cognex's solutions represent a shift toward automation in themselves, as they replace vast numbers of people who monitor manufacturing activity. The company's core market is factory automation (with a strong legacy in the automotive industry), and Cognex's management believes it can grow its revenue in this market by 20% over the long term. Cognex has the potential to grow a lot more (company revenue grew by 44% in 2017) by signing large agreements such as its transformational deal with Apple Inc. In fact, Apple remains its largest customer. In addition, Cognex is expanding its total addressable market, and therefore its growth potential, by opening up new markets. These include logistics (a market that management thinks it can grow by 50% a year, and one driven by e-commerce fulfillment), mobile terminals for barcode scanning, and airport baggage handling. 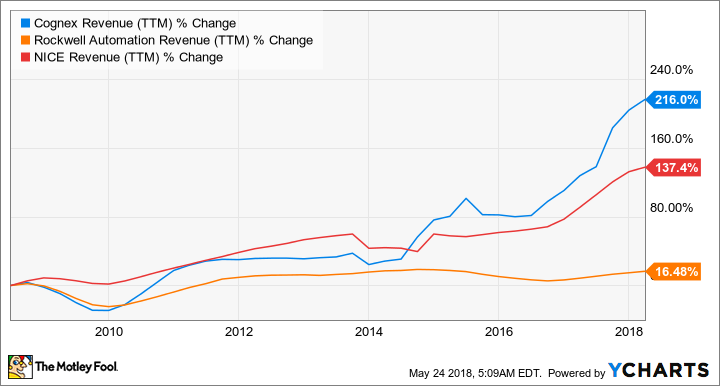 The company has a bright future, but as with every growth company, its revenue isn't going to go up in a straight line. That's clear from a look at its recent first-quarter earnings, where management lowered expectations for consumer electronics sales due to the timing of capital investment on OLED screens in smartphones. However, given Cognex's growth history, investors can be confident that this is more of a stumble than the beginning of any kind of structural decline -- now could be a good time to buy into a long-term growth story. CGNX revenue data by YCharts. TTM = trailing 12 months. Having seen the company fend off aggressive takeover bids from Emerson Electric six months ago, investors in Rockwell must have a sense of frustration as Emerson has outperformed Rockwell's stock by more than 20% since then. In the long term, Rockwell's discrete automation solutions (automated processes in the manufacturing industry) give it exposure to robotics. Moreover, the company's sensors, controls, and data analytics make it a key play on growth in the Internet of Things (IoT). Rockwell is growing less than Emerson in the near term because the latter's key process automation market (turning raw materials into products) is growing more than discrete automation. Rockwell's first-quarter earnings were slightly disappointing, with management reflecting on the fact that the capital spending plans of its customers aren't quite in line with what you might expect in an improving manufacturing environment. No matter: If you believe in the long-term future of increasing automation in manufacturing processes, robotics, and IoT, then Rockwell's growth rate is bound to improve. Moreover, capital spending on robotics, automation, and IoT isn't just about expansionary capital spending; it also helps cut costs by improving efficiency. Rockwell is surely primed for growth. NICE, a data analytics and AI solutions company, is best known for its customer engagement and financial crime and compliance solutions. I know what you're wondering: Just why is such a company being discussed as a robotics stock? The answer lies in NICE's robotic automation solutions. The front-office work of many customer-facing companies and government departments involves a high number of repetitive, mundane, and time-consuming tasks. This is where NICE's robotic solutions come in. They enable companies to automate manual tasks such as form filling and data entry. Implementing automation solutions into NICE's traditional real-time analytics offerings (used in customer engagement facilities like call centers and government offices) is a natural fit. And it adds a growth driver to NICE's solutions. 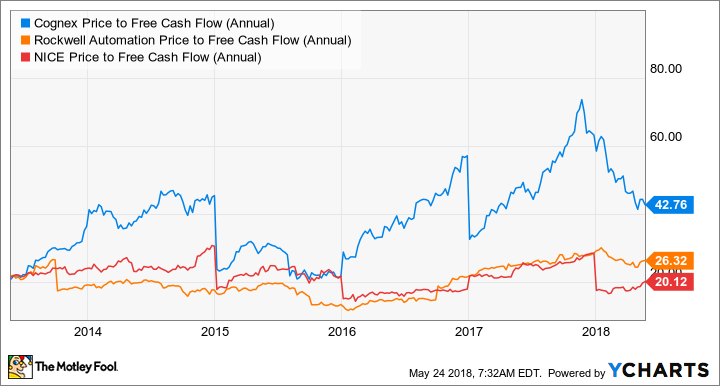 All three offer good long-term growth prospects from robotics, but on a free-cash-flow basis, NICE is the most attractively valued right now -- analysts have earnings growing at a double-digit rate for the next few years. CGNX price-to-free-cash-flow data by YCharts. Rockwell's earnings are forecast to grow in the mid-teens for the next couple of years, but there could be upside to those forecasts if capital spending in automation picks up. Meanwhile, Cognex's growth could easily pick up with a few large consumer electronics deals -- that may need to wait until 2019, though.